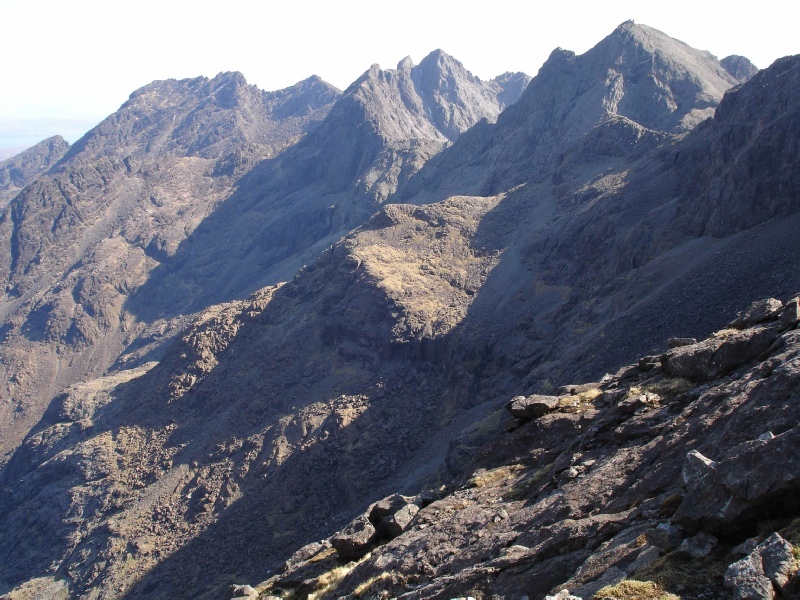 Between Glen Brittle and Sligachan, the Traverse of the Cuillin ridge involves about 10,000ft of ascent and descent. Each section of the ridge demands attention and the expedition is long and strenuous. 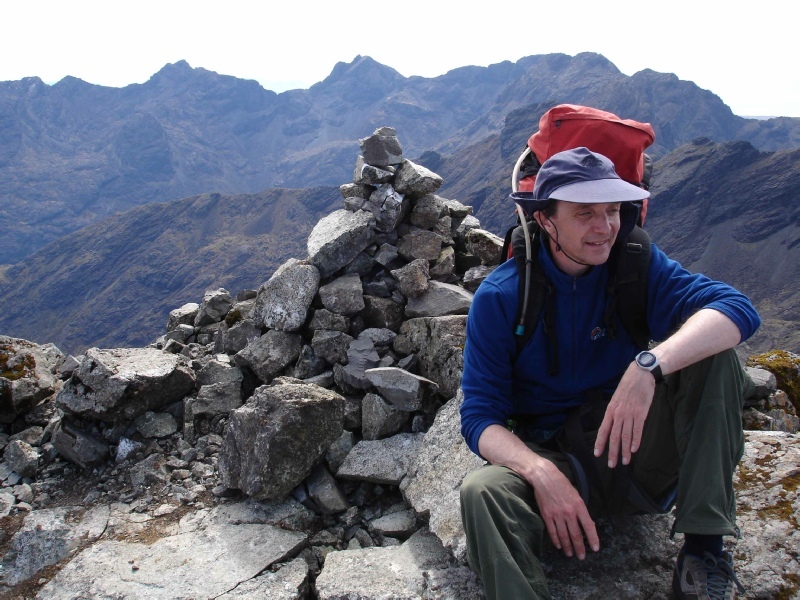 The Traverse was completed, on our first attempt, from South to North starting at Gars-bheinn and included every peak on the Main Ridge plus Sgurr Alistair, finishing on Sgurr nan Gillean. 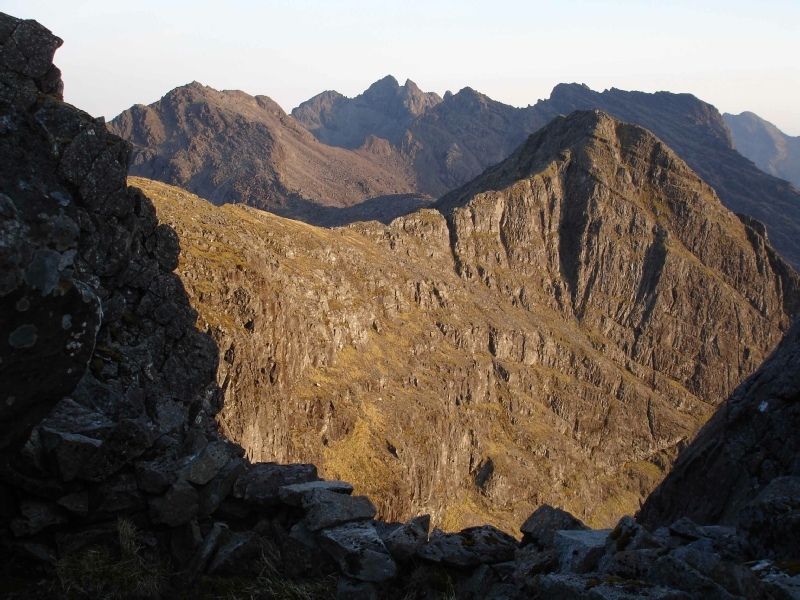 The main features were the Thearlaich Dubh Gap, the descent of Sgurr Thearlich, the ascent of Sgurr MhicCoinnich by Kings Chimney, the Inaccessible Pinnacle, the tops of Sgurr MhicCoinnich, the tops of Bidean Druim nan Ramh and the South-West Face of the Bhasteir Tooth by Naithsmith Route. Having being told that preparation was the key to a successful first attempt at the Traverse, as many sources of information as possible were collected and a guide compiled for ease of reference on the ridge. Links to the sources can be found below. The lack of water is a problem on the Traverse. This was solved by melting snow gathered from the small patches that were left in crevices on the Ridge. Expedition members were Jonathon and David. Further photographs are available here. After setting off from Glen Brittle campsite at about 3:30 in the morning, the main Coire Lagan path was easily followed in the dark. As we made our way past Coir' a' Ghrunnda, the light of the dawn started to herald in a fantastic day of weather. 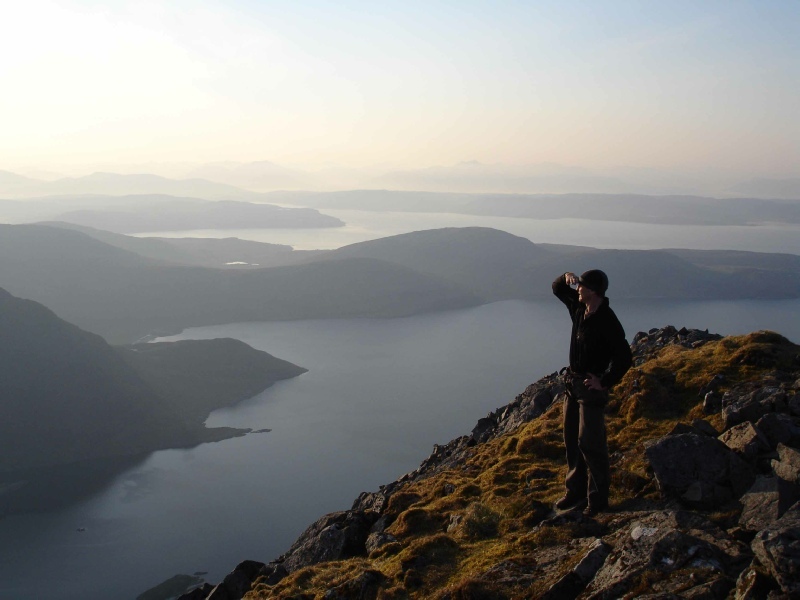 Eigg, Rhum and Muck were now visible and the way to Gars-Bhein clear. The top was reached at about 6:30 and it was a welcome relief after the hard toil of the climb up. Our first view of the whole Ridge, as we came to the crest, was truly memorable but a bit daunting. A group of climbers were met on the summit who had bivied the night before but had been delayed at the start due to difficulties in navigation in Choir' a' Ghrunnda. The first sectioh of the Ridge posed no problems as we kept to the crest of Sgurr a' Choire Bhig and then onto Sgur Nan Eag. Caisteal a' Garb-choire was circumnavigated on the right side and good scrambling lead to Bealach Coir' an Lochain. The approach to the first climbing section, the Thealaich-Dubh gap, was steep but with plenty of good holds. A short abseil took us down to the rock bridge in the gap. The way up the opposite wall was quite obvious with a steep and polished chimney groove. Climbing the groove was entertaining but not desperate in the ideal conditions. 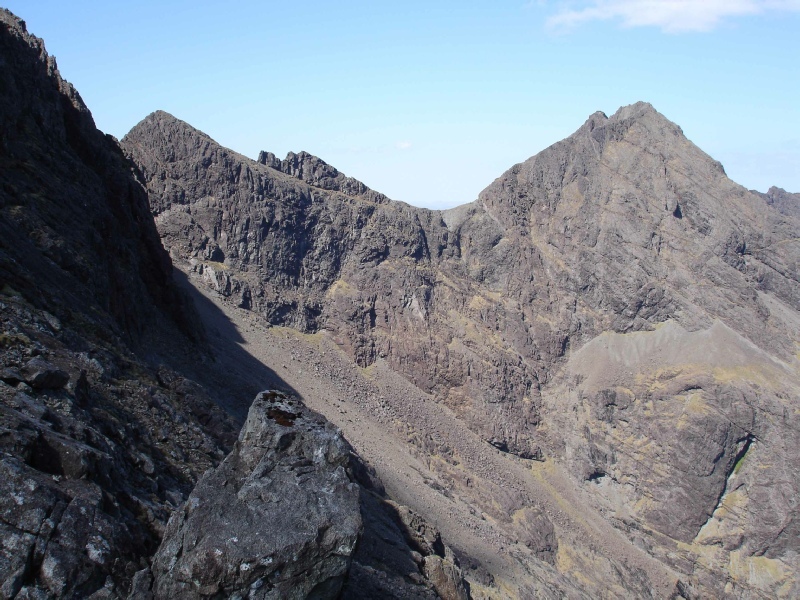 Thealaich Dubh Gap - Sgurr Mhic Coinnich - Innaccessible Pinnacle. Above the gap we headed for the top of the Great Stone Shoot and the summit of Sgurr Alastair. 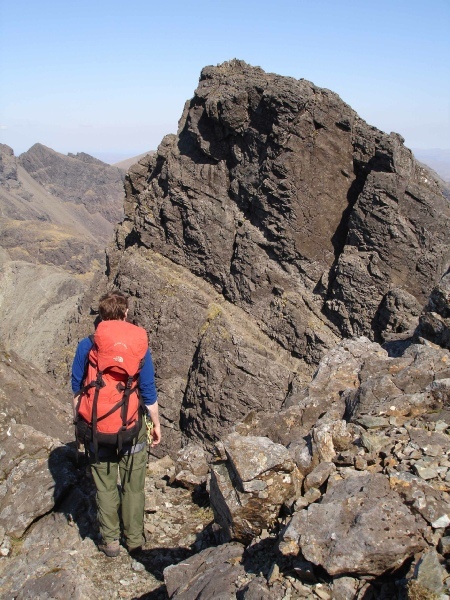 The guidebooks all mentioned that care should be taken on the descent of Sgurr Thearlich. The Ridge was followed to a broad promontory with sheer drops on all sides. The abundance of abseil slings confirmed our choice to abseil from this point. Below the abseil, easier scrambling lead to the Bealach Mhic Coinnich. The climb of Kings Chimney to the top of Sgurr Mhic Coinnich was the climbing highlight and not to be missed by using the traverse of Collies Ledge. The corner is climbed on good holds and an undercut before pulling over onto the summit. 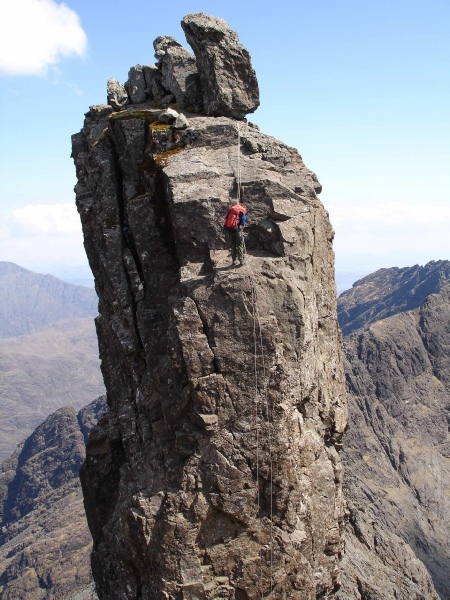 An Stac was climbed by following the crest of the ridge giving excellent scrambling over good clean rock and a ramp then taken to the foot of the Innaccessible Pinnacle. A few people were roping up at the bottom so we politely asked if they would mind if we jumped the queue to solo the climb. No objections were raised so we set off up the Pinnacle. The climb is very exposed but at no time did it feel intimidating. 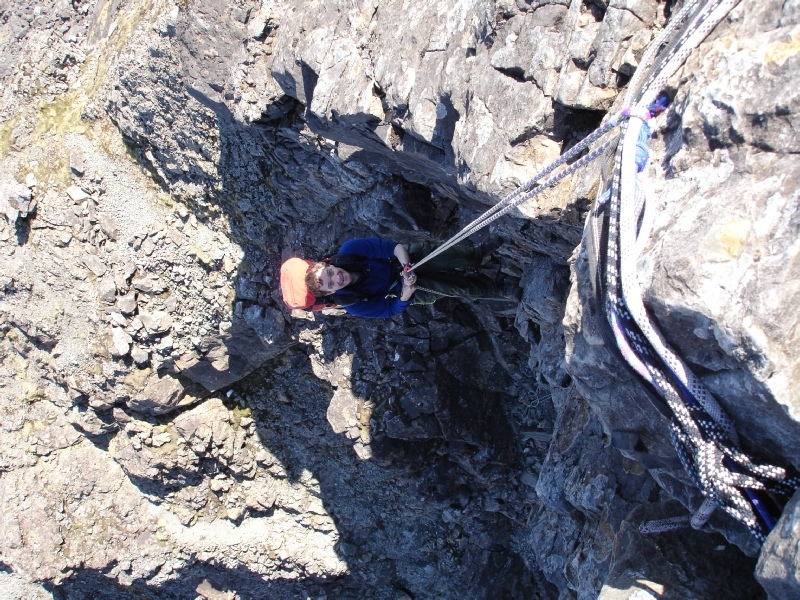 It was nice to find the very reassuring wire sling at the top ready to take the rope for the abseil. The central section of the ridge has blurred somewhat in the memory, my lasting impression is that it took a long time!. 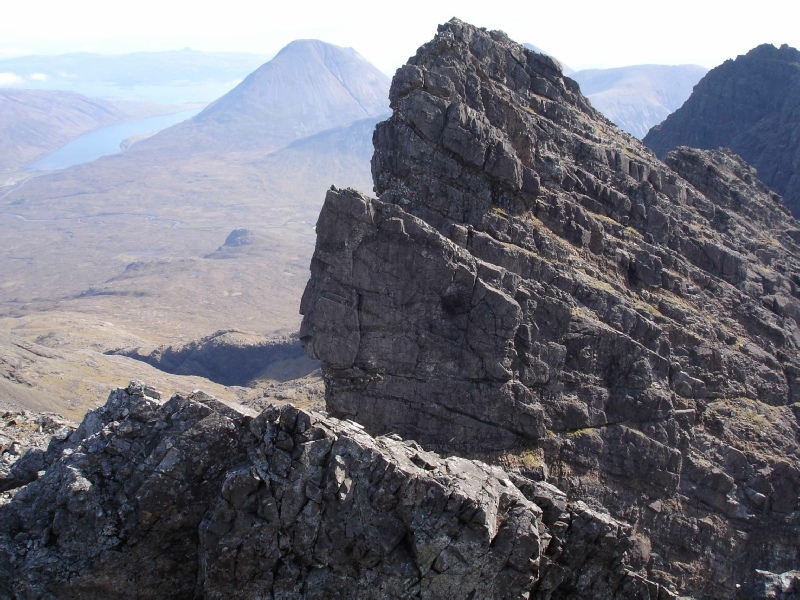 No problems were encountered on the traverse of Sgurr Bananchdich and the tricky traverse on the ascent of Thormaid was avoided. The descent from Sgurr Thormaid took us to the Three Teeth which were passed on the right hand side. 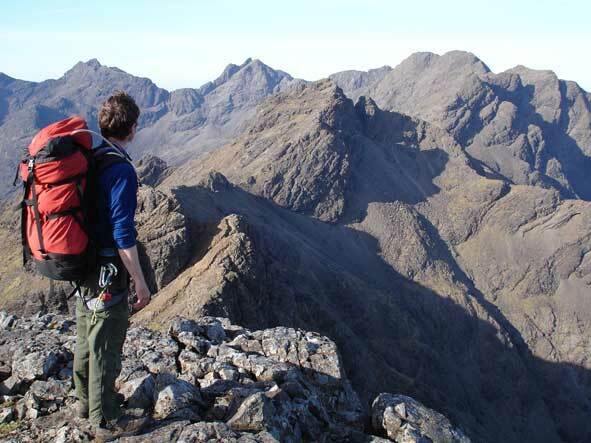 Sgurr Greadaich was crossed on the crest of the ridge along the wonderful knife edge arete between the summits. The four tops of Sgurr Mhaidaih took us some time with the two steep sections on the west faces of the Third and Second tops being taken directly. A steep descent found us on the only grassy section of the whole ridge, the Bealch na Glaic Moire. After a stop for the video diary entry, the intimidating Bidean Druim Nam Ramh was reached. The first summit was climbed easily with the use of a basalt dyke. The gap between the first summit and main summit was then approached with some trepidation. The ascent of the main summit looked very tricky so we retraced out steps to the first summit to check we were still on the right route. After this confirmation, we approached the gap again and worked out a way up the rock to the main summit. The descent from the main summit looked just as intimidating as the ascent, so an abseil was set up to take us to the belach. In the fading light and with tiredness setting in, the route to the top of the North peak looked beyond us so we made the decision to bivuac at this point. Not an ideal spot, a steep scree slope with little space to stretch out but it felt like this was the best thing to do. Bivi bags and warm clothes were donned and we attempted to get some sleep. Six hours later, after a cold and sleepless night, we were met by a fantastic dawn. Patches of mist lay in the corries below us but with clear skies above. Spirits revived we set off up the North peak. This involved the most serious scrambling outside the recognised climbs on the route. Anywhere else in Britain and parties would definitely have roped up for this! A rake on the right side of the summit lead us to the Bealach Harta. 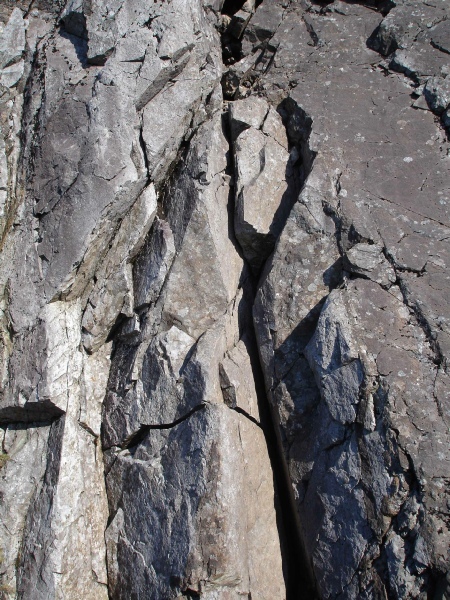 An Caisteal was approached via a jump across a deep vertical notch. The descent from An Caisteal was problematic on loose rock but we managed to avoid the wonderfully named Belly Ledge. 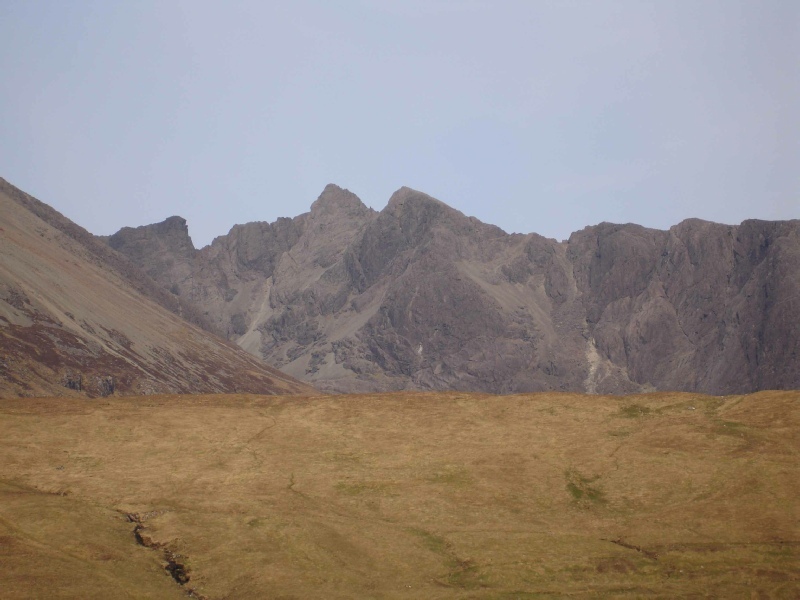 The long stretch of the ridge across Sgurr na Bhairnich to the summit of Bruach na Frithe and on to the Bhasteir Tooth was soon completed. The atmosphere of standing underneath the Tooth has to experienced to be believed. If either of us had said at this point " I don't like the look of this" I think we would have given up. But neither of us did, hoping that the other party would say something first. So Jonathon set off to lead Naismith's route. We attempted it in two pitches - the first a traverse to the crack at the right end of the face and then the cracked wall itself. The suituation on the crack is sensational with great exposure but we were mightily relieved to have got the last climb over with. 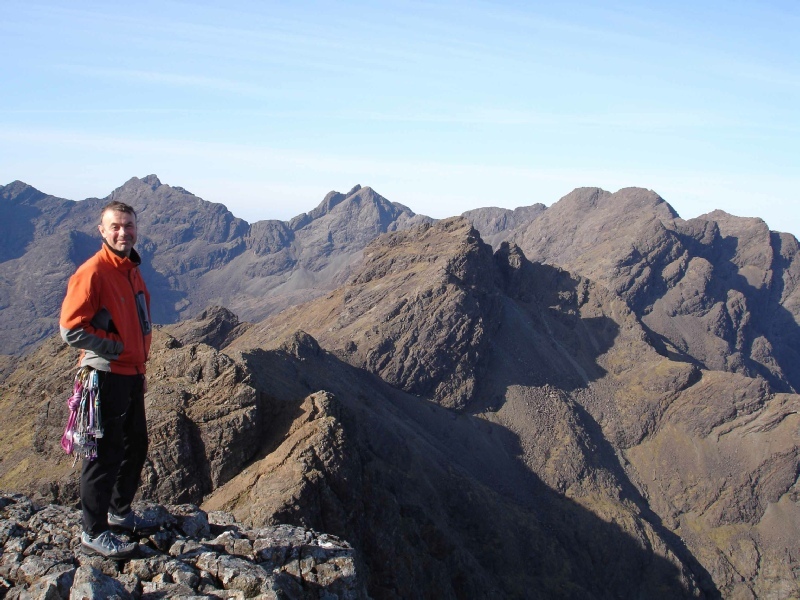 The ascent of Am Bhasteir involved some short but steep climbing but we were soon on the summit and comparing notes on the Cuillin peaks we had climbed with a group of walkers in preparation for an guided attempt at the Innaccessible Pinnacle. 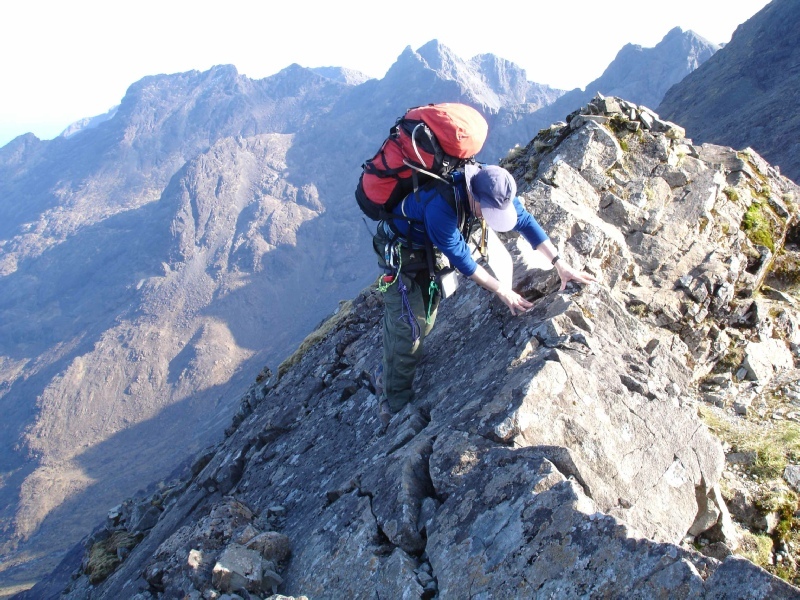 The final peak of the Traverse, Sgurr Nan Gillean, was reached by an exposed scramble past the site of the long departed Gendarme to the summit. Looking back from the last summit on the terrain covered during the past two days filled us with immense satisfaction. 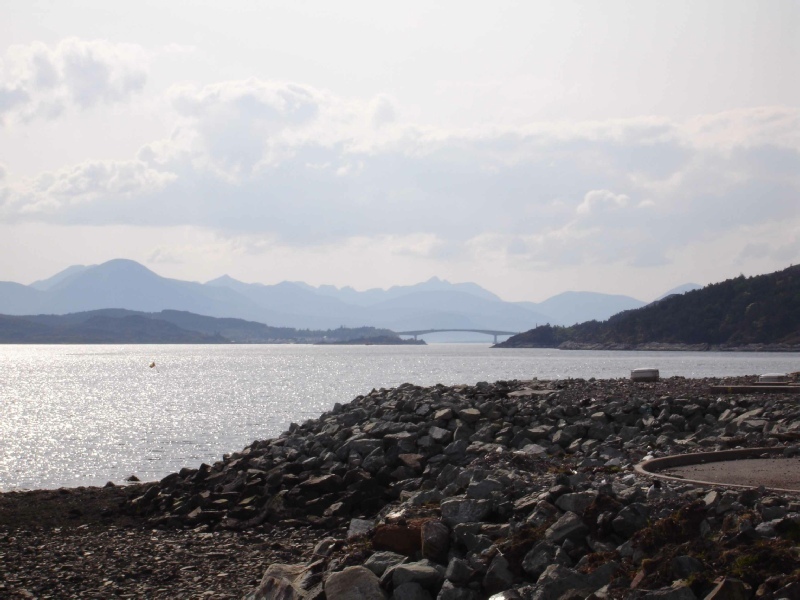 The heady mixture of magnificent sea and loch views with the thrill of the scrambling, rock climbing and route finding make this the most memorable of expeditions. 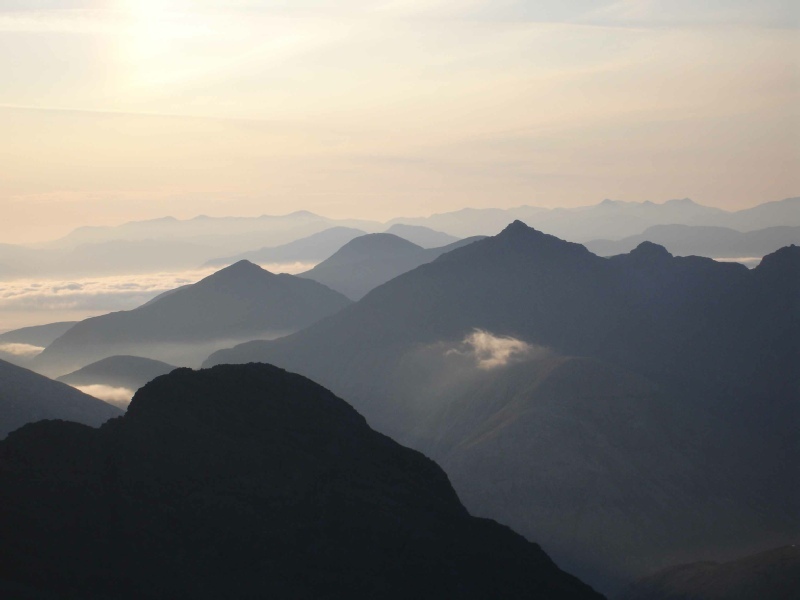 The Sligachan beckoned with the thought of good food and a bed. It really doesn't come better than that!